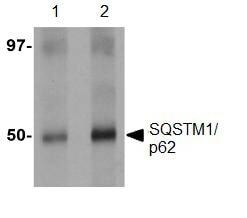 Synthetic peptide corresponding to Human SQSTM1/ p62 (C terminal). WB: Mouse gastrocnemius lysate; Human spleen tissue lysate. 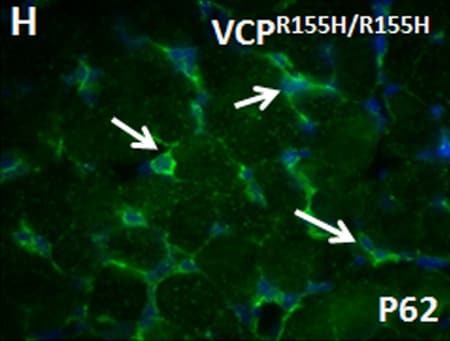 IHC: Mouse VCPR155H/R155H quadricep tissue. IHC-P: Human spleen tissue. ICC/IF: HeLa cells; Murine embryonic fibroblast; Rat spleen cells. Our Abpromise guarantee covers the use of ab91526 in the following tested applications. WB Use a concentration of 1 - 2 µg/ml. Predicted molecular weight: 47 kDa. A431 (human epidermoid carcinoma cell line) cells stained for SQSTM1 / p62 (green) using ab91526 at 20 µg/ml in ICC/IF. 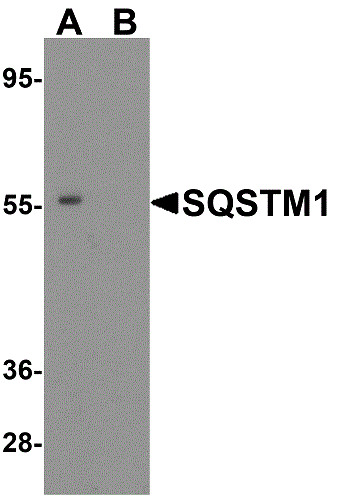 Immunofluorescence of SQSTM1 in Rat Spleen cells using ab91526 at 20 ug/ml. 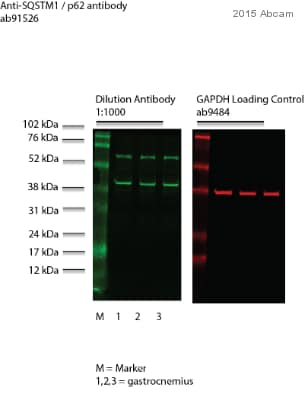 Immunohistochemistry (PFA perfusion fixed frozen sections) - Anti-SQSTM1 / p62 antibody (ab91526)Image from Nalbandian A et al., PLoS ONE 7(9): e46308. Fig 2.; doi: 10.1371/journal.pone.0046308. Epub 2012 Sep 28. Immunohistochemical analysis of mouse VCPR155H/R155H quadricep tissue, staining SQSTM1 / p62 (green) with ab91526. Mice were transcardially perfused with 4% paraformaldehyde before muscle tissue was frozen and sectioned. 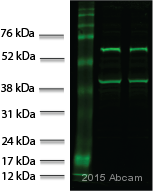 Tissue was incubated with primary antibody before detection with a fluorescein-conjugated anti-rabbit secondary antibody. Nuclei were stained with DAPI (blue). 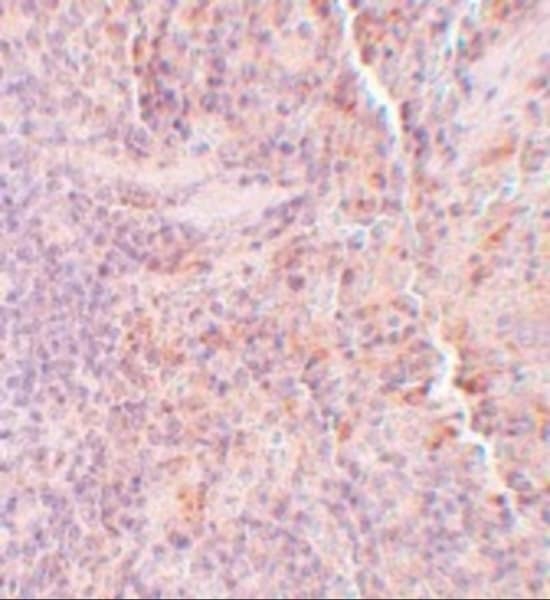 Paraffin-embedded human spleen tissue stained for SQSTM1/p62 using ab91526 at 5 µg/ml in immunohistochemical analysis. 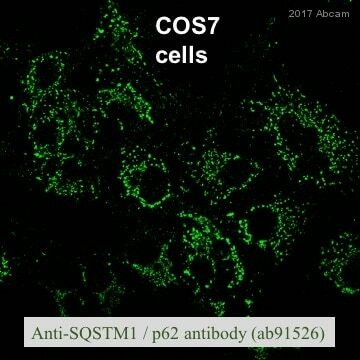 Immunocytochemistry/ Immunofluorescence - Anti-SQSTM1 / p62 antibody (ab91526)Image from Traver MK et al, J Biol Chem. 2011 Sep 2;286(35):30471-80. Epub 2011 Jul 12, Fig 5. 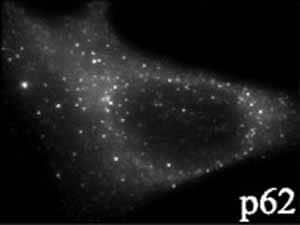 DOI 10.1074/jbc.M111.251967 September 2, 2011 The Journal of Biological Chemistry, 286, 30471-30480.
ab91526 at a 1/500 dilution staining SQSTM1/ p62 in wild type murine embryonic fibroblasts by Immunocytochemistry/ Immunofluorescence. 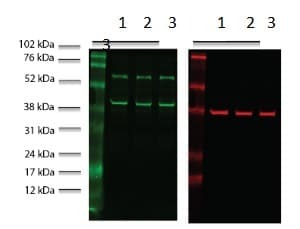 Western blot analysis of SQSTM1 expression in K562 cell lysate with ab91526 at 1µg/ml in (A) the absence and (B) the presence of blocking peptide. 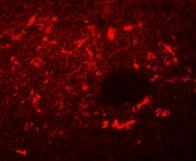 Rat spleen tissue stained for SQSTM1 / p62 using ab91526 at 5 μg/ml in immunohistochemical analysis. 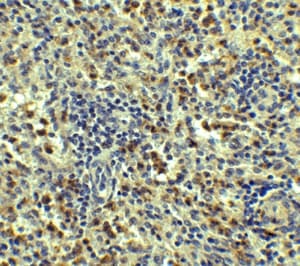 Mouse spleen tissue stained for SQSTM1 / p62 using ab91526 at 2 μg/ml in immunohistochemical analysis. Publishing research using ab91526? Please let us know so that we can cite the reference in this datasheet.